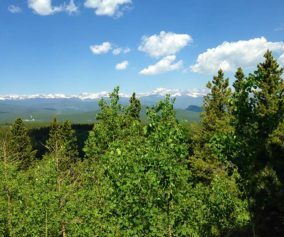 The Horseshoe Trail in Golden Gate Canyon State Park is a wonderful hike for older kids, experienced and non-experienced hikers. It’s a great trail for spotting wildlife, from birds to deer, viewing fall colors and wildflowers, and taking in the beautiful scenic view along the trail. Several of the backcountry campsites areas are also accessible from the Horseshoe trail. 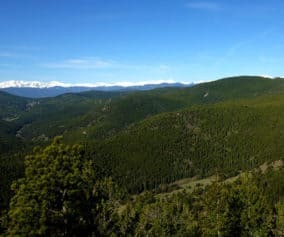 We’ll detail those locations, provide links to a trail map, driving directions and more in the trail profile on this Colorado hike. 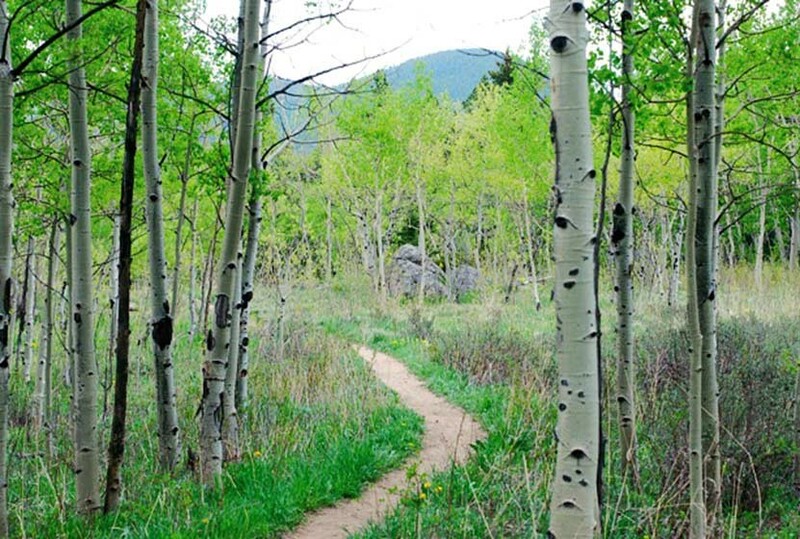 Golden Gate Canyon’s Horseshoe Trail is a 3.6 mile out-and-back hike (1.8 miles one-way). We’ve rated it as moderate in difficulty because of the 900+ feet of elevation gain. 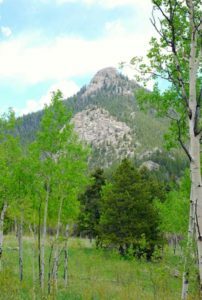 The Horseshoe Trail is popular because it follows the beds of several small streams, winds through groves of aspen trees, and leads to beautiful meadows, as well as three of Golden Gate Canyon State Park’s backcountry camping areas. To get to the trailhead (first,use our driving directions). Once in the park, exit to the right out of the Visitors Center–you’ll want to stop here first to pick up a map. You’ll find the Frazer Meadows parking area and trailhead for the Horseshoe Trail on the left-hand side of the road. Keep in mind that parking is limited, so it would be best to arrive early. There are also restrooms at the Horseshoe trail trailhead and we found them to be kept up and clean. One of the highlights of this trail are the streams that run along it. You’ll find that there are several small bridges to cross as you make your way up the trail. Seasonal streams also mean that sections of the Horseshoe trail will get muddy on after rains and during the Spring melt-water runoff. But water also means wildflowers, and this trail comes alive with them in late Spring through the Summer. 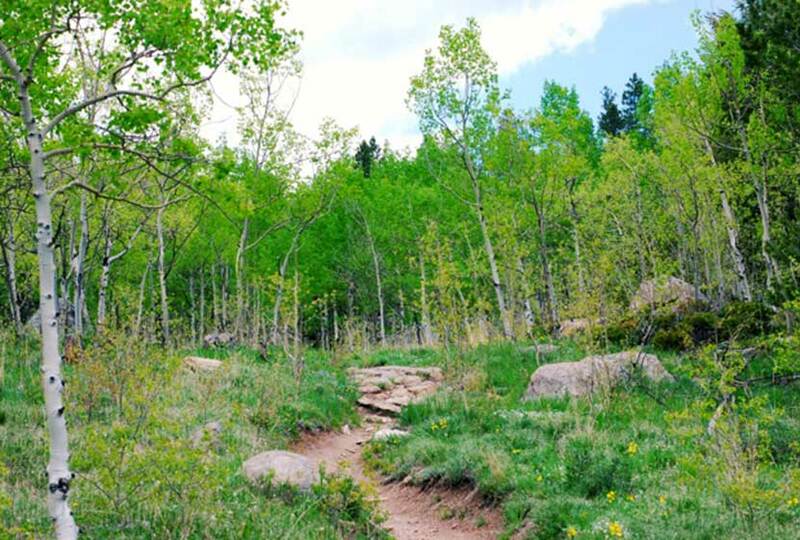 The Horseshoe Trail also leads you to access trails for three of the five Golden Gate Canyon backcountry camping areas. 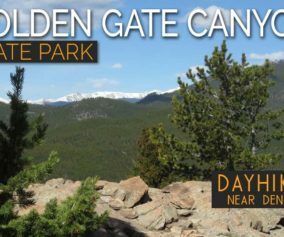 Use this link to the backcountry camping brochure to get details on cost per night and how to make campsite reservations in Golden Gate Canyon State Park. The first campsite access trail is at 1.1 miles and will take you to Greenfield Meadows, which has 4 campsites. Continuing on the same spur, you can hike further in to the Frazer Meadow campsite which has 4 campsites and one backcountry shelter. If you continue on the Horseshoe trail, you’ll come upon the access trail for Rim Meadow campsite at 1.3 miles. Rim Meadow also has 4 campsites. 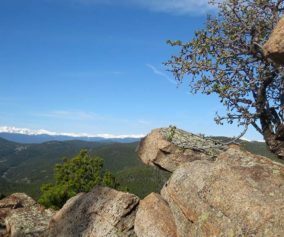 Sun protection: The trail is often shaded–a rare thing for Front Range hikes–but be sure to bring sun protection because it is almost 4 miles round trip and there are areas exposed to the sun. I just wanted to tell you how much I love your site. Unlike a lot of other hiking sites, yours has all the details I needed to make a quick decision about where I’m going today and also told me exactly how to get there and what to take. Usually the other sites give you one piece and you have to search elsewhere, but yours has everything. Plus, it’s a visually attractive site, which helps too. Thanks for putting this together.